Shopping for YuYu Hakusho Statues? Joining Hiei and Kurama in Kotobukiya's line of YuYu Hakusho ArtFx J Statues is the Underworld Detective himself, Yusuke Urameshi! Ready to tackle his new career, the detective stands in a tough pose, showing off his muscular chest and arms. 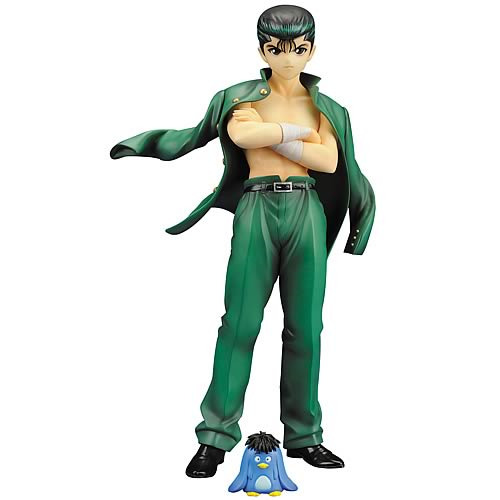 Stripped to the waist, Yusuke wears green pants with white wrist wraps and a black belt and shoes; a matching removable green jacket rests over his shoulders and billows in the wind with great life-life movement. Excellent sculpting really brings this anime character to life from his impressive physique to the details on his clothing. He even comes with a mini-figure of Puu, the detective's spirit beast! This figure stands approximately 7-inches tall. Ages 14 and up. Created in 1990, the original YuYu Hakusho series ran for years and was then adapted to anime, telling the tales of a student who is brought back from death to serve as an "Underworld Detective" fighting supernatural crime. Now, the great characters from YuYu Hakusho are coming to you in the ArtFx J Series, a bold expansion designed "to bring classic Japanese characters to their fans worldwide." A junior high school delinquent with a penchant for fighting, Yusuke nevertheless proved his goodness by sacrificing himself to save a child.